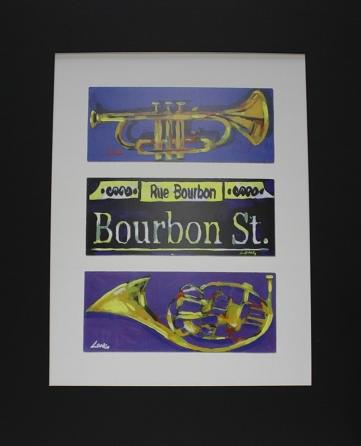 Bourbon Street Sign and Trumpet Print by Chris Long 13.25x16"
Home > New Orleans Gifts > Bourbon Street Sign and Trumpet Print by Chris Long 13.25x16"
Bourbon Street Sign and Trumpet Print by Chris Long. This is a perfect print for an office, kitchen, or living room. Matted Print measures 13.25x16".